All the Rostyle wheels, even the spare, are suffering from surface rust. 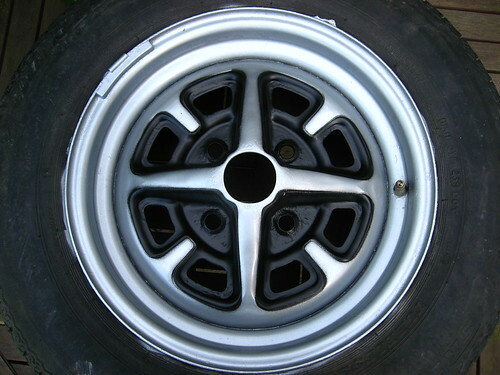 Following some very good instructions I had a go at restoring the spare wheel to a just-off-the-factory-floor look. I've got a couple of hints when doing this. The first is take your time to mask off the tyre (if it's still attached) as it will save time trying to wipe silver paint off later. A good trick is to slightly deflate the tyre to allow you to get masking tape/newspaper under the rim for a good seal. The second tip is to get hold of a plastic wheel mask from Moss. This costs about Â£12, but is well worth it for the time it will save you with tricky masking and the clean lines it will produce, plus it's re-usable. If doing the job with the tyre on you'll need to drill a hole for the valve to pop though, but that doesn't take more than a couple of seconds - make the hole quite a bit bigger than the valve to let you adjust the fit of the mask. I added a few bits of masking tape doubled over between the mask and wheel to ensure a close fit in the 'spoke' areas. Wire brush / wet-and-dry off any rust from the surface of the wheel. In my case this also meant getting rid of some previous restoration work. Mask off the tyre and prime the wheel for a good adherence for the next layer. Coat the wheel with a few coats of silver wheel paint. Add a couple of coats of clearcoat to seal the silver and give it a shiny look. Place the plastic mask over the wheel and give it a couple of coats of black wheel paint. make sure you get the vertical bits of black near the centre of the wheel. In all I'm very happy with the result. I got a little bit of silver on the tyre, but that's why I started on the spare! With new wheel nuts and centre badges they will look like new. Update: With new tyres on and the practice gained from the spare, the results were really good.